Islam and Ahmadism with a reply to questions raised by Pandit Jawahar Lal Nehru authored by Dr. Sir Muhammad Iqbal. Aalami Majlis e Tahaffuz e Khatm e Nabuwwat is presenting this lucid and impressive statement of Dr. Sir Muhammad Iqbal to the English knowing and through it the whole world hopes that those who take the views of Ulama as narrow minded and bigoted will realize the grave nature of the mischief both religious and cultural that Ahmadism tends to cause to the body politic of Islam. 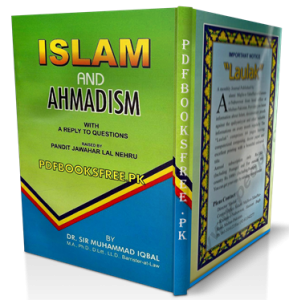 This book “Islam and Ahmadism” is now available here on Pakistan virtual library for reading and download. Check out the following links to read online or download the complete book in Pdf format to enjoy offline reading. study habits can create awareness among generations.